It’s not terribly uncommon. Get a bunch of apartments together, and there’s enough money left over to decorate them in a royal fashion, a kingly style. 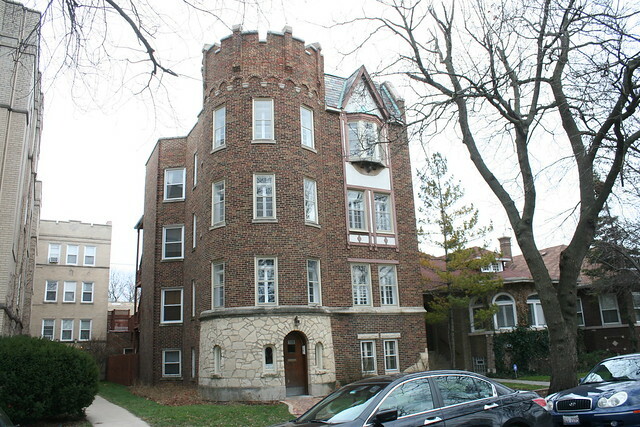 Yes, truly, you can make these men’s homes… their castles. 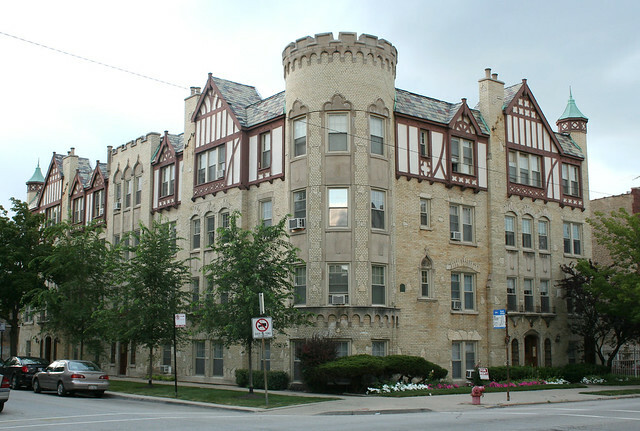 Park Castle Apartments – 2416-2458 W. Greenleaf Avenue, at Indian Boundary Park, West Ridge. 1925, architect Jens J. Jensen; developers Gubbins, McDonnell and Blietz. 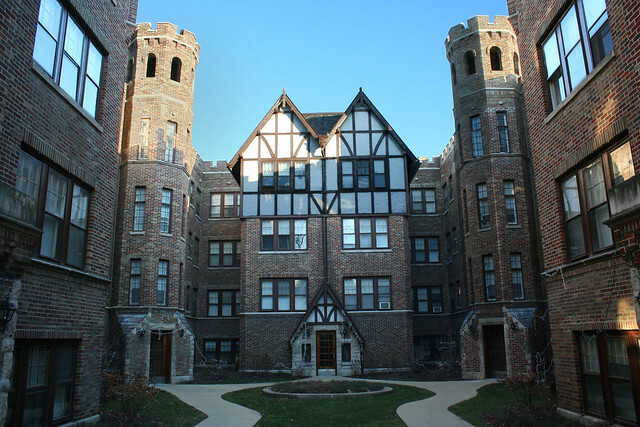 The Park Castle, along with the neighboring Park Gables, is famed for its elaborate design and its wonderfully designed swimming pool. 2548 -2458 W. Fitch at Rockwell – just northwest of Indian Boundary Park, West Ridge. 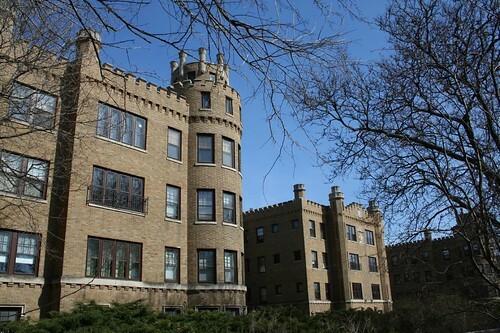 Castellated architecture has its roots in the Gothic Revival and its Romantic views of the middle ages. 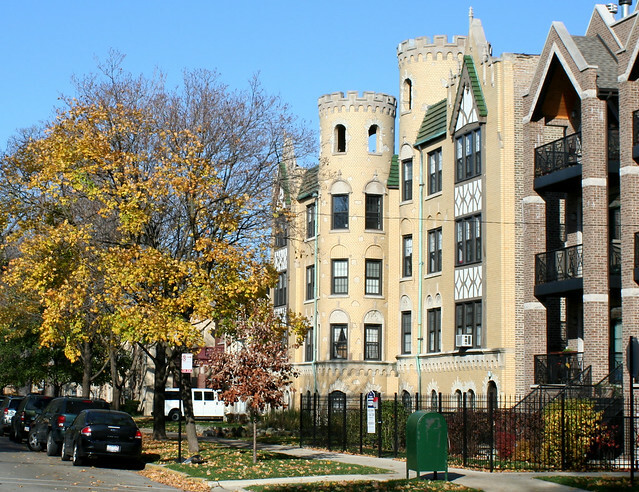 In the eclectic 1920s, when a tidal wave of revival styles swept across America, a variety of castellated styles were used on large apartment buildings around Chicagoland. The implications of luxurious living – worthy of a monarch – would make a powerful advertising statement for the developers trying to fill their newly constructed buildings, as well as pleasing neighbors concerned about the aesthetics of a large new building in their neighborhood. The most common castle architectural elements include massive turrets with small “arrow slit” windows, rough limestone bases, and crenelated rooflines. Of course, the need to supply the basics of a modern home, such as windows, mean that the castle motif can only run so far. 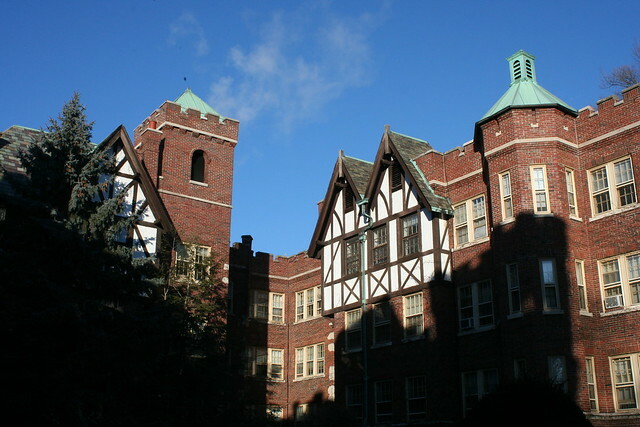 On most examples, it is combined with a Tudor Revival style, which uses faux half-timbering for some surfaces for a more domestic effect which also happens to be more amenable to larger windows. The castle craze was part of the period revival craze of the 1920s, when practically every style associated with pre-industrial society came into vogue. 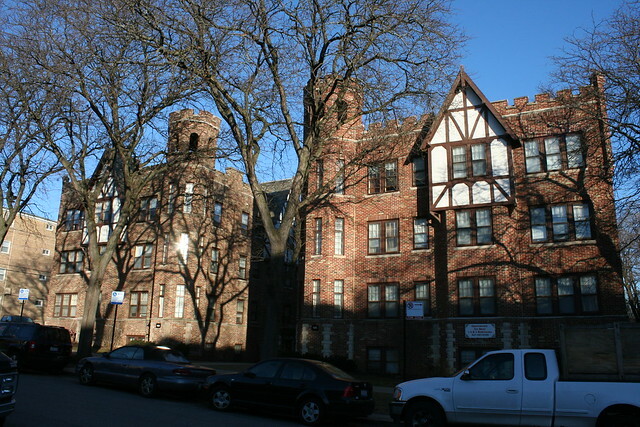 901-927 Wesley Avenue, Oak Park, IL – the Paulina Mansions Apartments. 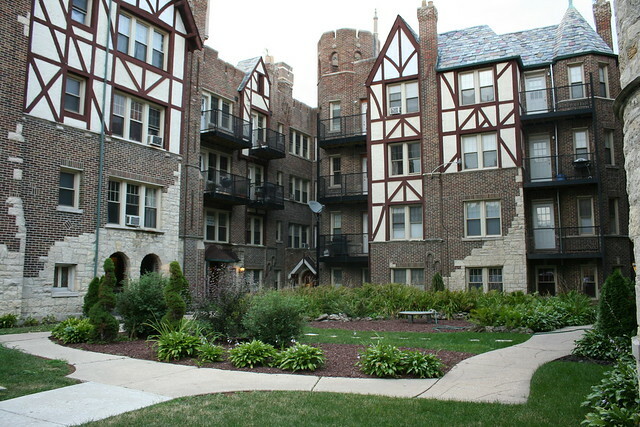 1926 – with particularly strong Tudor Revival components – along with a cloister screen across the courtyard entrance. 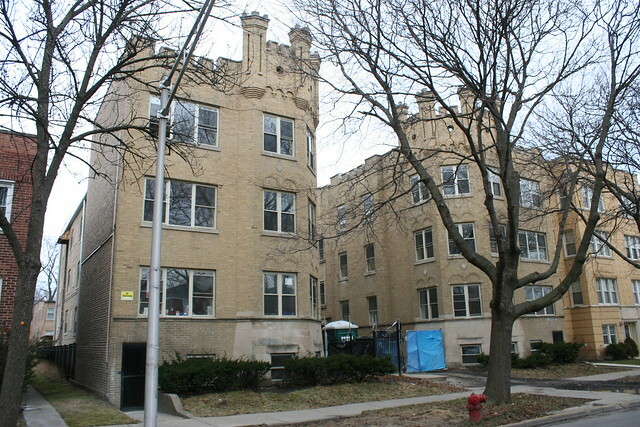 5700-5702 N. Kimball Avenue, Chicago – 1929 – billed as “Old English towers” with features including “canvased walls” and rollaway beds. 2722-2730 W. Lunt, West Ridge – was gutted circa 2008 and remains under renovation in early 2013. 5651-5659 N. Spaulding at Hollywood, 1929, architect R.H. Johnson, builders Magnuson Brothers (Tribune July 21, 1929) – a particularly fine example, with ample detailing and architecturally decorated lobbies. 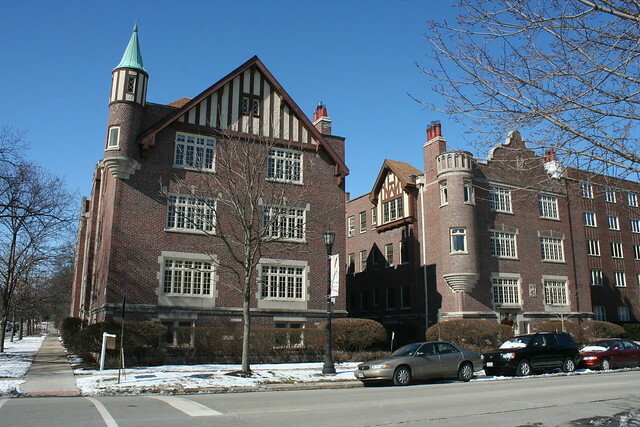 Church View Apartments – 1450-56 Oak Avenue / 1101-11 Lake Street, Evanston – 1926, architect Samuel N. Crowen – Crowen was notable as the designer of Michigan Avenue’s Willoughby Tower and the Biograph Theater on Lincoln Avenue. 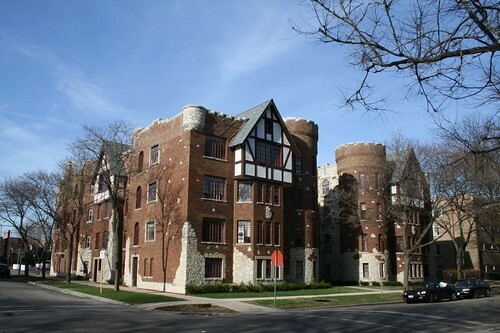 Cable & Spitz – the combined firm of Max Lowell Cable and Alexander H. Spitz, both 1916 graduates of the Armour Institute – had a successful practice in the pre-Depression era, turning out a number of castellated Tudor Revival buildings. 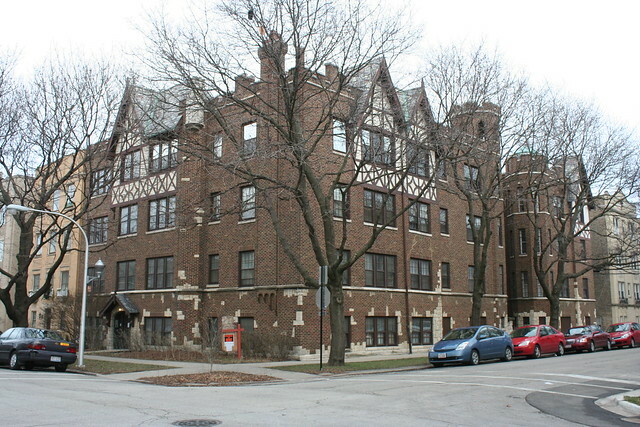 2100 – 2110 W Fargo Ave, 1927 – architects Cable & Spitz. 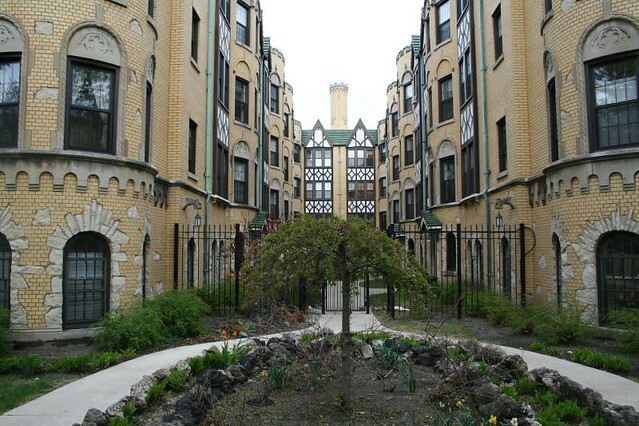 The entire block behind this building is lined on both sides with medieval-styled apartment buildings. 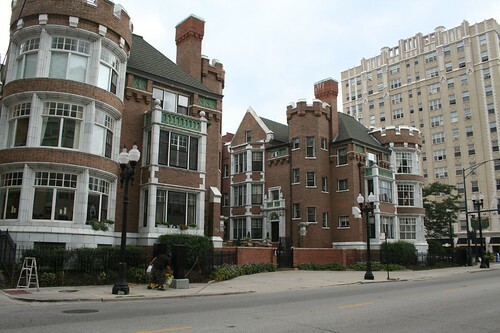 Castle elements could even be used on the classic Chicago 3-flat plan, as with these two apartment buildings which have a giant tower form as a bay window occupying most of the front facade. 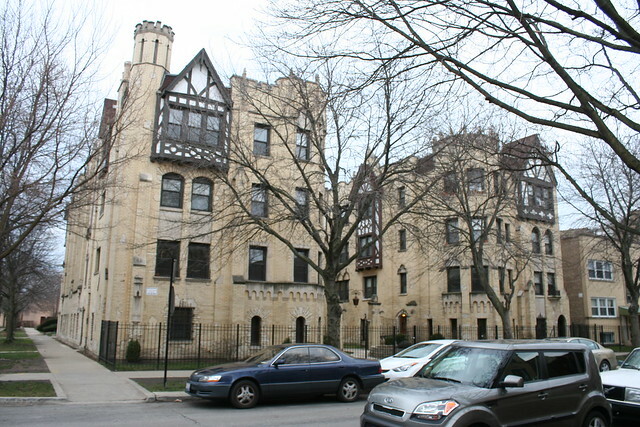 Other castle elements include the crenelated roofline of the tower; also of note is the sloping stone facade over the entryway – an element common on the English Cottage revival houses popular around the same time. The buildings above, with only one exception, went up in the late 1920s. The Great Depression, of course, put the kibosh on any further such flights of fancy. By the time construction resumed in the 1950s, both style and economics demanded the simplicity of Modernism. 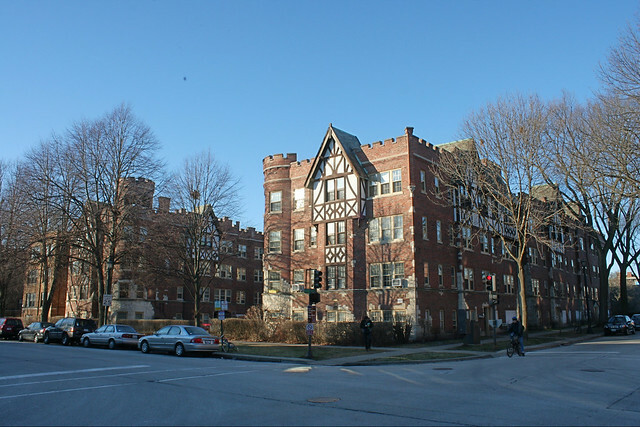 Castle apartments were a quaint curiosity – a last hoorah for historicist revivalism. This entry was posted in Period Revival Styles. Bookmark the permalink. 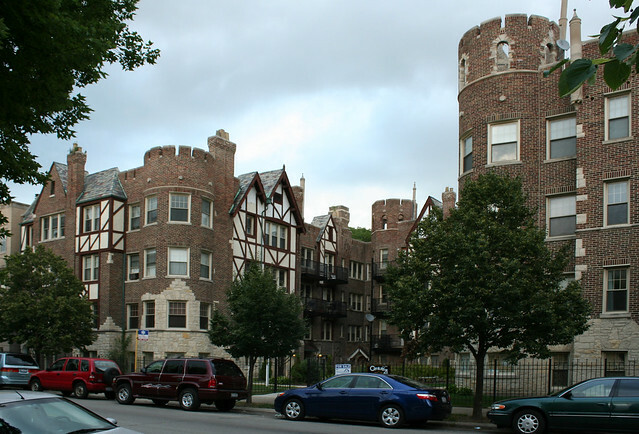 There’s some down on Longwood & 108th Pl too, perhaps a homage to the Givens Castle at 103rd & Longwood. Nice! I even photographed those a few years back, but totally forgot about them. It’s been too long since I ventured down to the deep south side. 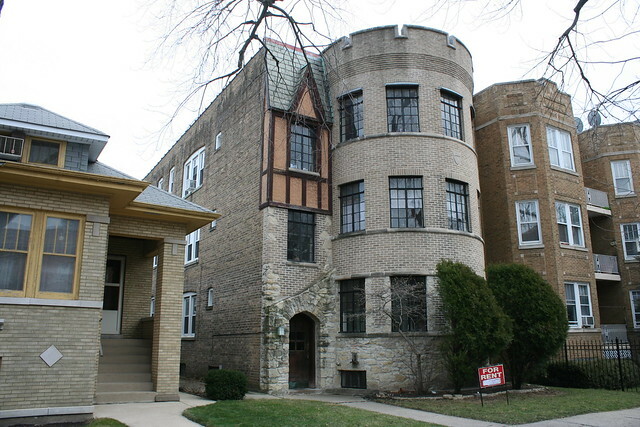 Cable & Spitz did a job down that way, too – a couple of Tudor Revival houses at 89th and S. Hamilton Avenue, according to the city’s landmarks database. 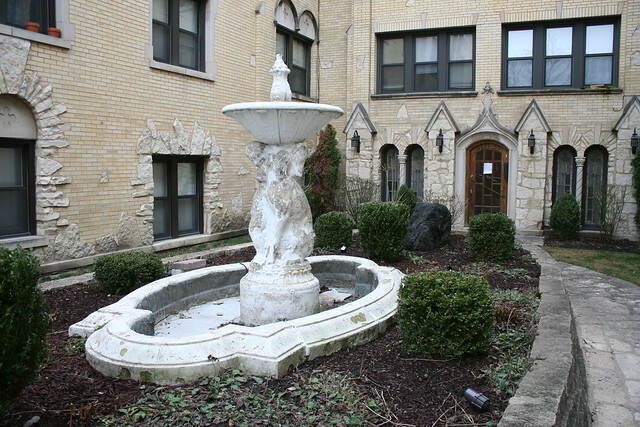 There is one of these on the west side of Drexel between 49th and 50th. It is interesting because there is an original building in this style and an addition from the last decade that attempts to echo the original style. It is hard to see from the google street view. Another extraordinary post — this blog has really become essential for anyone interested in Chicago history. 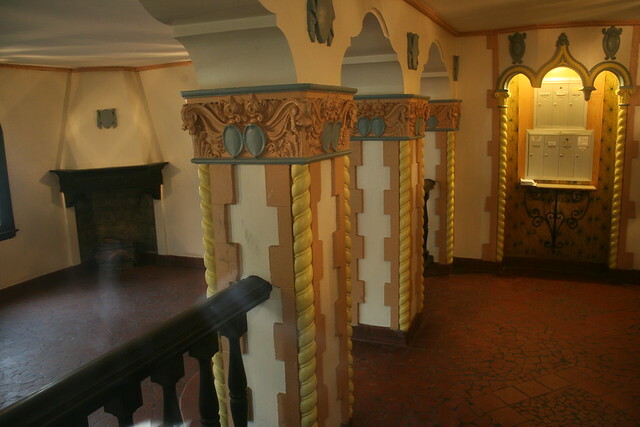 It would be interesting, if you get the opportunity, to do a bit more about the odd interior detailing in some of these castle buildings — I lived in one many years ago, and the vestible and lobby had all kinds of curious decorations like something out of Sir Walter Scott. great post – we only recently discovered your site – very glad we did! This is a great post – thank you! As a kid, my family lived just south of Park Castles, across Greenleaf. We had friends in the building and I was fortunate enough to swim in the pool a few times. It’s quite a sight. 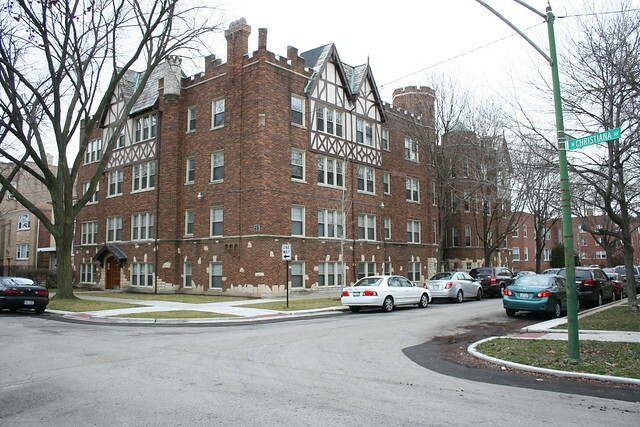 One note – I believe the building you identify as being at 2722-2730 W. Touhy is actually on the 2700 block of W. Lunt Ave. The 2700 block of Touhy is mostly commercial. @KJ: Thanks – you’re entirely correct; it is indeed on Lunt. I’d like to call that a typo but it’s more like a brain fart. @Lee Sandlin – Thank you! And a good point about the interiors. I often poke my nose the glass or step inside lobbies when they’re not locked from the outside, but most of the ones I saw were fairly plain. Just as there are surely more of these buildings I’ve missed, there’s probably fancier lobbies than the ones I’ve covered here. 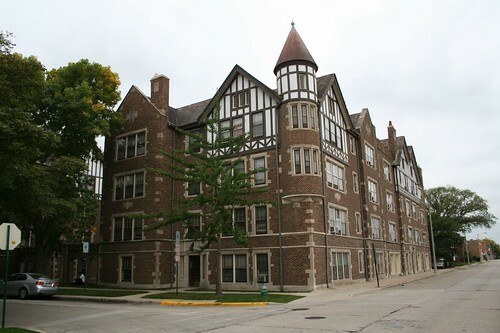 A few years ago a bought a blueprint for the 5651 N. Spaulding building at an estate sale.